The subject of pruning hydrangeas is one of hot debate. Many argue the shrubs do best left entirely to their own devices, producing bigger flowers and more vigorous growth naturally than they do with human interference. Others maintain that most hydrangeas benefit from a little annual tidying. If you do choose to prune your hydrangeas, do so armed not only with a pair of pruning shears, but also with a thorough understanding of the growth habits of this exquisite flowering shrub. Unlike some flowering shrubs, most hydrangeas do not require pruning for vigorous growth or optimum flower development. In fact, overzealous pruning can actually hinder blossom formation. Most hydrangeas form blooms on second year growth. Cutting back too much of the established wood might increase shoot development, but it will also reduce the number of blossoms on your hydrangea. This seems to be the case for most hydrangeas, but some horticulturalists cite exceptions to this rule. 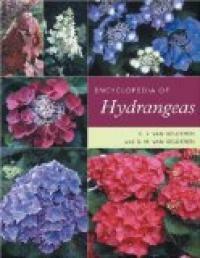 In the 2006 book Encyclopedia of Hydrangeas, authors Gelderen and van Gelderen point out that Hydrangea paniculata responds favorably to pruning. Gently pruned, this species will produce larger flowers on more vigorous shoots than it would if left alone. The authors caution, however, that there will be fewer flowers on a pruned shrub than a natural shrub, but these few will show spectacular size and bloom development that makes up for the reduced overall number of blooms. In warm climates, you can get away with pruning hydrangeas at any point in the growing season, but it is usually preferable to prune when the plant is not actively growing. Ideally, a late autumn pruning after all the year's flowers have faded, or an early spring trim before new shoots develop will maximize the plant's use of resources while allowing you full enjoyment of the flowers each year. In cold climates, the extra growth seems to offer some protection from winter cold. 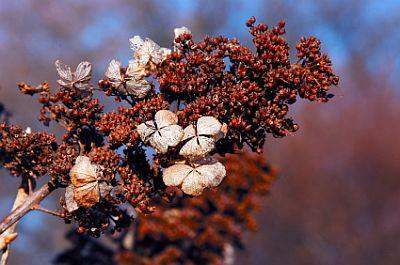 In these regions, postpone pruning hydrangeas until the cold of winter has passed to reduce damage to the plant. Prune early in spring, before the shrub shows signs of growth. Decide how much you want to remove from the bush, and divide that volume by three. Carry out one-third of this pruning each year over three successive years to reduce shock to the plant. Ensure that pruning sheers are clean and sharp to minimize damage to the plant tissues. Select branches that appear long or spindly compared to neighboring branches, or cut those that grow outside of the desired shape. Follow the length of the branch until you find a pair of leaf buds on each side of the stem. Cut approximately one quarter of an inch above these buds. Do not apply pruning paint or any other substance to the cut edge. Plants are naturally adapted browsing from herbivores, and will grow new tissue over the wound site without outside interference. Pruning hydrangeas to deal with undesirable growth habits requires a different method than basic maintenance pruning. If your plants are not flowering well and have taken on a spindly appearance, renovation pruning may be required to restore bushy growth and abundant flower development. In this case, a hard pruning is needed. As with simple pruning, cut back to just above a pair of leaf buds, but do so right near the base of the bush, cutting back most of the height of the plant. This type of pruning is best performed in winter when the plant is dormant. Expect to wait a full season or two before you see rejuvenated blooms on the new growth. Pruning hydrangeas or any other bush is as much an art as a science, and you will find that as the years progress you will develop your own techniques to achieve desired results. Whenever possible, prune conservatively and watch how your plants respond to the treatment. Over the years, you will develop a relationship with your hydrangeas that will allow you to bring out the best in them while creating a garden space that fills you with a sense of peace and accomplishment.